Delptronics offers circuit, PCB, and firmware design services for your company. Using Delptronics design services you can get your product to market faster. We can design complete products, modules, or sub-circuits. We also offer embedded systems programming services. We have flexible terms that can include co-branded or white label products. We also offer design and build services geared specifically toward interactive music exhibits. While most of our clients prefer to use our services without attribution, below are some co-branded products designed by Delptronics. 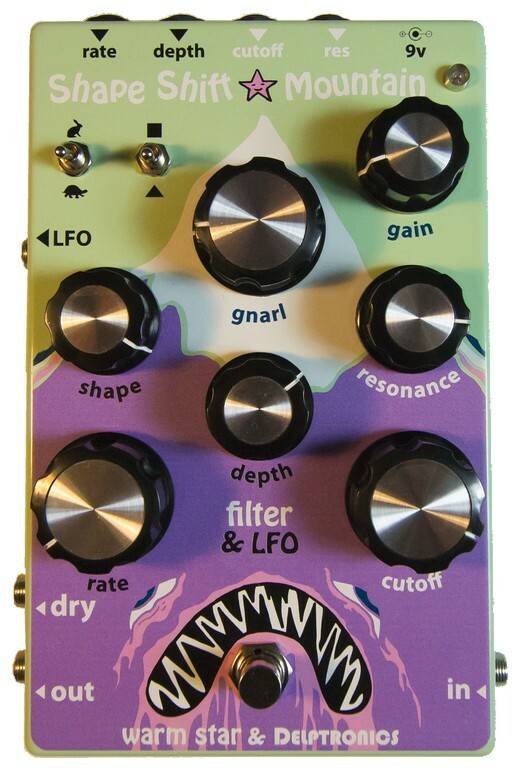 Delptronics designed the Shape Shift Mountain pedal and Eurorack module for Warm Star Electronics. It is a voltage controlled low pass filter with an integrated LFO. It uses the classic SSM2044 filter chip. Delptronics designed the circuit based on Warm Star&apos;s requirements and delivered a schematic, bill of materials, PCB layout, and a working prototype. Electro-Faustus asked us to help create a Eurorack module of their Blackfly pedal. The Blackfly has two amplified springs. We added a gain knob to bring the spring waveforms up to modular levels. In addition to a waveform output, we added a rectified output, and an envelope follower. Finally, we added a 1/5/10V LED VU meter.